The hobby has a number of stars from one sport crossing over into another. 1991 Upper Deck Baseball Michael Jordan SP1, 1990 Score Rookie/Traded Baseball Eric Lindros, and 2014 Bowman Russell Wilson are just a couple that come to mind. 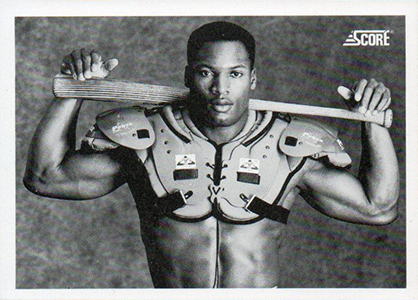 And then there's the iconic 1990 Score Bo Jackson card that covers two sports at once. 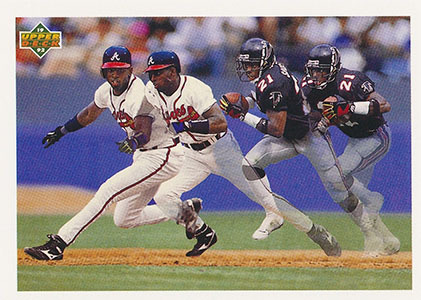 It's the same with this 1992 Upper Deck Deion Sanders. Things are picking up again with a trio of football stars appearing on high-profile baseball cards. First up is Johnny Manziel. Leaf announced plans a while back to have the Browns' quarterback in their late-season releases 2014 Metal Draft, 2014 Valiant and 2014 Leaf Trinity. Topps followed suit, putting him in a Padres uniform (the team drafted him in the 28th round) and including him on the 2014 Bowman Chrome Draft Prospect Autographs checklist. Now it's time for a trio of all-time great quarterbacks. 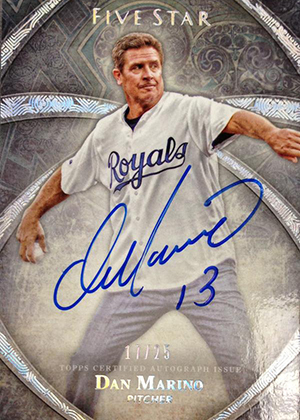 Tom Brady, John Elway and Dan Marino are all in 2014 Topps Five Star -- Baseball. The quarterbacks all have autographs in the super high-end release. Like Manziel, all three were MLB draft picks back in the day. The Montreal Expos grabbed Brady in the 18th round in 1995. That was the same round the New York Yankees took Elway in 1979. Marino went in the 4th round in 1979 to the Kansas City Royals. This isn't the first John Elway baseball card. He actually has quite a few including a 1982 TCMA Oneonta Yankees minor league card. 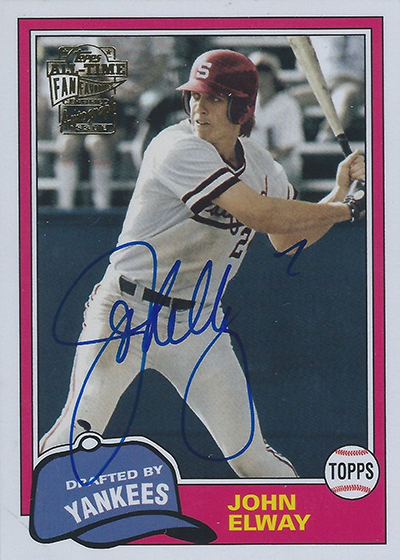 More recently, Topps had John Elway baseball cards and autographs in 2005 Topps All-Time Fan Favorites.